If you look in the first Back in the Day Bakery cookbook, you'll find the Chocolate Heaven cake with chocolate buttercream recipe. It's the first thing Cheryl Day (the baking wizard at the bakery) learned to make with her grandmother and what she considers the best cake she's ever had It's so special that it served as her wedding cake (which took place at the bakery)! Tips, tips, tips...Looking at this recipe, I learned some of the reasons why this cake is so good. We've got high-quality chocolate at work here. 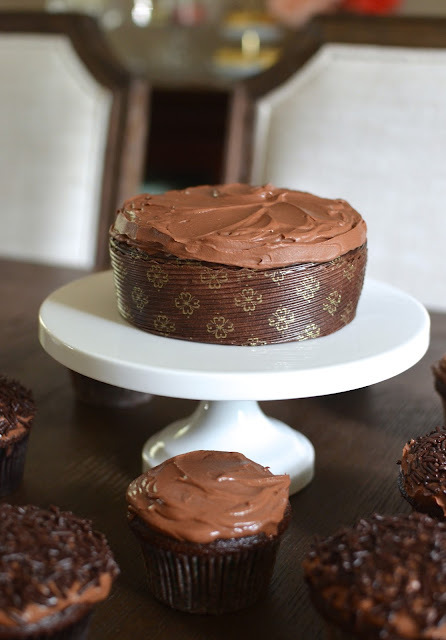 Cheryl uses Scharffen Berger brand chocolate for both the unsweetened chocolate in the cake and the semisweet chocolate used in the buttercream frosting. I am a huge fan of Scharffen Berger and I seem to like it more each time I bake with it. Splurge on it and you'll see what I mean. Coffee. Once again, this is a testimonial to how using freshly brewed hot coffee really ignites the chocolate flavor in the cake/cupcakes. Sour cream. I'm starting to think that the secret to great bakes (particularly, classic Southern bakes that somehow makes us feel nostalgic no matter where we're from) is sour cream. Yogurt is great but I can't help but think sour cream has an extra magical property when it comes to baking. Oil for moisture. The oil, as opposed to butter, in this cake makes it extra moist. Cake flour helps make it light and tender. The recipe in the book makes a 3-layer cake, frosted and filled with about 7 cups of chocolate buttercream frosting. Honestly, it would be my ideal wedding cake, too! Since the cake would likely be sliced to about 12 servings, I'd say that enjoying it this way, scaled down via cupcakes, is a wise way to have a little slice of heaven for everyday. To make the cupcake from the cake recipe, I reduced it by half. As for the frosting, I scaled it down even further, making one-third the amount. Doing this, you should yield about 16-18 cupcakes. I baked 12 cupcakes (filling my cups fairly high) and baked the rest of the batter in a 5-inch round cake pan. As you see from above, the cake batter will be pretty fluid. The cupcakes bake up in about 25 minutes; my mini cake took about 40 minutes. Look for the cake to spring back when lightly touched and for a cake tester to come out clean. You see the domes on my cupcake. The ones at the bakery appeared to have been flat so that we had an even (and thick) layer of the delicious frosting on top. I certainly didn't want to waste any cupcake by trimming the tops so I kept them as it. As a result, I had a thinner frosting in the center of my cupcakes. Now...let's talk a little about the frosting. This frosting is very similar to Ina's (or Beatty's) chocolate cake, minus the egg yolk. It's silky, smooth, creamy, and chocolaty. Now for frosting and sprinkling the cupcakes! As I mentioned, don't skip the sprinkles. Dunk your frosted cupcake right into a bowl of chocolate sprinkles and press gently to coat the top. It's really just the thing. Even my husband, who generally prefers his cupcakes, cakes, donuts sans sprinkles, liked these better with the sprinkles (we tried it both ways). All said and done, it was so fun re-creating these cupcakes from Back in the Day Bakery! Even though they might not have been quite as tender or fluffy as the ones at the bakery, they were pretty close to the genuine article! It made me so happy to have these at home, recreating that moment of bliss we had on vacation. We devoured the dozen cupcakes in a few days (they keep so well and stay super moist; I stored them in the fridge and brought them fully to room temperature before eating). And as an added bonus, I had the mini cake, which I froze...and we're planning to enjoy imminently. 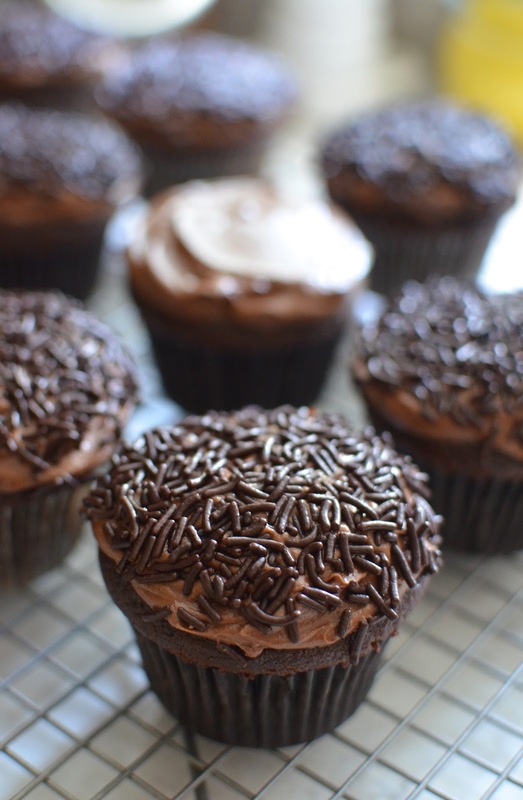 Who wouldn't want to be transported to heaven via a delicious chocolate cupcake! 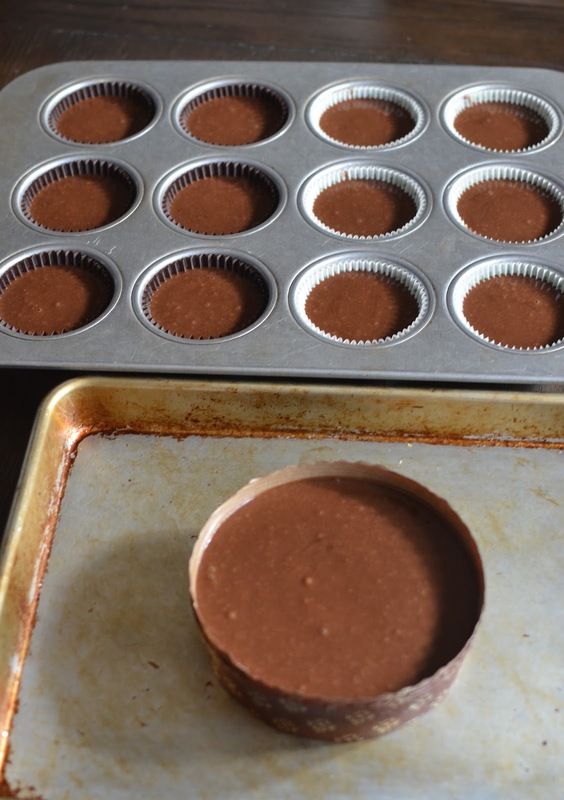 Make cupcakes: Line 2 regular-size muffin tins with 18 paper liners. Position a rack in the lower third of the oven and preheat oven to 350 degrees. In the bowl of a stand mixer fitted with the paddle attachment, combine flour, sugar, baking soda, and salt. Run mixer on low for 2-3 minutes to aerate the flour. Meanwhile, place chocolate in a medium bowl and pour the hot coffee and vanilla over it. Let stand for about 2 minutes to melt the chocolate. Stir thoroughly until smooth (it's going to smell amazing). In another bowl, whisk eggs and oil together until thick and satiny, light in color. Whisk in the sour cream, being careful not to overmix (leave visible streaks of white). Pour in the melted chocolate mixture and mix until just combined. Add this to the dry ingredients in thirds, mixing on medium speed until well blended. Remove the bowl from the mixer and using a rubber spatula, give the batter a good stir to incorporate any ingredients stuck to the bottom or side of the bowl. Divide the batter among the cupcake liners, filling them about 3/4 of the way. Tap the pans firmly on the counter to remove any air bubbles from the batter. Bake until the cake springs back slightly when touched and a cake tester comes out clean, about 25 minutes. The cakes should have slight cracks on top. Let cupcakes cool in the pan for about 5 minutes on a cooling rack, then carefully (they're quite tender) remove them from the tin and set the cupcakes on a wire rack to cool completely before frosting. Make frosting: Place chocolate in a heatproof bowl set over a pan of simmering water. Stir until chocolate is melted. Set aside to cool to room temperature. In the bowl of a stand mixer fitted with the paddle attachment, beat butter on medium speed until smooth and creamy. Add milk, mixing until blended. Add the cooled chocolate and mix until completely incorporated, about 2 minutes, scraping down the bowl with a rubber spatula as needed. Add vanilla until combined. With the mixer on low speed, gradually add all but about 3 tablespoons of the confectioners' sugar (you can eyeball it). Add the rest of the confectioners' sugar, as needed, to reach a creamy, silky consistency (I used a full 1 cup). Finish cupcakes: Frost cupcakes with a small offset spatula. Place chocolate sprinkles in a small bowl. Carefully invert each cupcake into the bowl of sprinkles, lightly pressing to adhere. Set cupcakes onto a serving platter and enjoy a few bites of chocolate heaven! oh my goodness do they little gems look delicious, how fun to sample bites of cupcakes with your family on vacation and then go home to bake them, that is my kind of holiday!!! Have a wonderful 3 day weekend! Thanks so much, Cheri. You have a relaxing and happy Labor Day weekend! Holy Moly! Whoever named them did so rightly. I can totally imagine how amazing they are after reading your description. The pictures are mind blowing. Looks like Back in the Day Bakery is going be on my bucket list of places to visit after today. Lots of CHOCOLATE...no wonder heavenly! And I adore the flavour pairing with coffee! This one is definitely worth all the calories, Monica. Absolutely right. I savor every bite. Totally worth it. 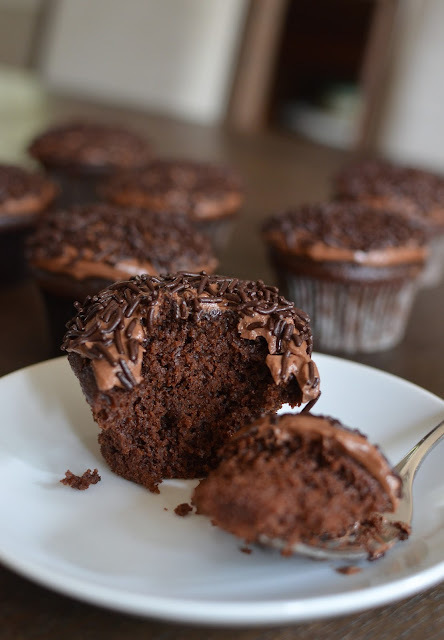 Sometimes there's really nothing like a chocolate cupcake with chocolate frosting! These look so delightful! Very true. This one is one awesome chocolate cupcake. Chocolate cupcakes twice in one week is heaven. Testing some and then making them! I bet your homemade hands down is the winner on all counts. Good quality agreements do really make the difference! My capacity for chocolate is a bit scary. : ) Very true about good quality ingredients. It really shines through. The bakery ones were far superior, believe me, but the homemade was a close second. I'm happy to be able to have that when I can't get to Savannah! - From Way2flowers Cup Cake Team. Outstanding recipe Monica - I really cannot wait to give it a try. You're right on with the comment about quality ingredients. Sometimes people will say they didn't like a recipe or it was meh, but when there are only a few ingredients, those important few must be great quality. Thank you so much for this must try recipe! Glad you had a lovely vacation. Looks divine! It's a recipe for my daughter, she is a big fan of chocolate! I am going to save this recipe for her:) Thanks for sharing Monica. It's totally divine. Any chocolate lover is bound to love them. Thank you! Oh Monica, you've got my number with these chocolate beauties! haha - I'm never long without something chocolaty baking! Oh my my. Chocolates are my weakness. 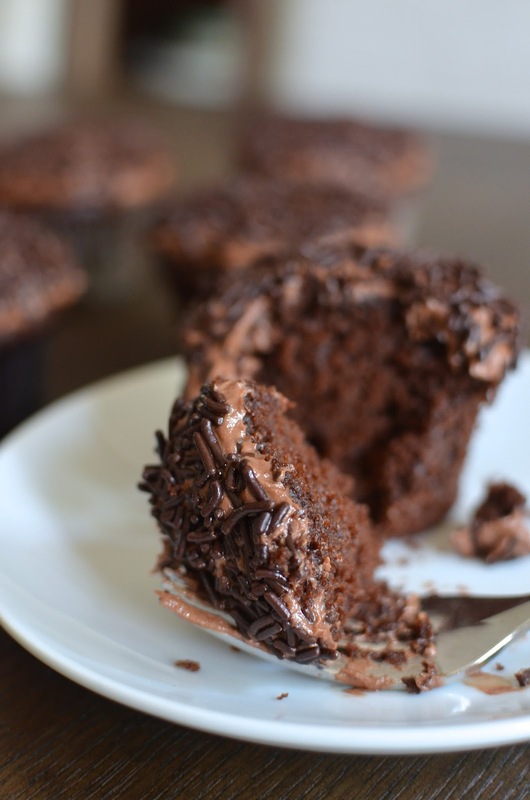 And these chocolate cupcakes look so sinfully decadent. I wish I could have them with a hot cup of strong coffee. I am sure my family would enjoy these. Have a great weekend, Monica. So many desserts just beg for a cup of coffee. Chocolate & coffee is perfect! These are amazing, Kelly. I want one right now! I just stumbled upon your blog and think it is sensational! Absolutely love it. I live in Australia and wonder whether you would recommend buying this cookbook, "Back in the Day Bakery"? I have so many cookbooks and trying to only buy ones that are so good that I bake lots from them. Looking forward to searching your blog and making a list of must-makes! Many thanks! I was lucky enough to visit this bakery in Savannah and what I sampled was as delicious as I expected. The cookbook is adorable and I would recommend it if you bake a lot and want a cheerful, solid cookbook to add to your collection. That said, sometimes space is just limited and we can't get every great book. I would try to look through it (at a bookstore, at the library) and see how the recipes appeal to you before buying. Happy baking!